The Rooke nursery was one of the oldest customers of the South pottery. Pots had been supplied from the days of the Dysons Road pottery until the White Hart Lane premises closed in October 1960. George Rooke, with Henry Cull, had founded his nursery in Tottenham and, later, in 1902, moved to Cheshunt. In 1912, Samuel South(1) gave George Rooke an impressive ornamental pottery urn and stand supported on a pottery plinth. Overall it is four feet high. 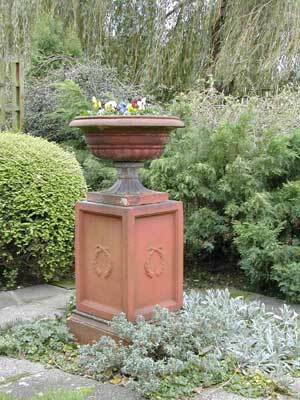 The urn has been in use for the past 80 years and now stands in the Cheshunt garden of Peter Rooke, the grandson of George. - Chris Johnson who is researching the pottery of G & A Tuck at Waltham Abbey that closed in 1963. - Christine Reed whose father, Leslie Woor, was a long serving potter at Samuel South & Sons until the closure in 1960. - Nikki King whose grandparents lived in Snells Park, the one time home of Samuel(1) at 43 Snells Park and Samuel(2) at number 39. - Tristan White whose great uncle was a director of Direct Mineral Water Supplies (DMWS), the mineral water manufacturers occupying premise close to the potteries in White Hart Lane. - Jim Clifton a descendant of the Field family which occupied River House prior to Samuel South(2). His great aunt, Emily Field, married Arthur South, the brother of Samuel(2). - Julie Perrim the great granddaughter of Joseph Hardisty, a fellow passenger with Joseph South on board the Buckinghamshire during the emigration voyage to New Zealand in 1874. Quiz - Jean & Ian Bowyer. Farthest travelled participants - Michael & Hazel Short (New Zealand). A prize should also have been available for the best comment of the day made by John Short. Whilst walking around the grave yard of Reed church and noticing the disturbance caused by the burrowing activities of the local rabbits, he dryly remarked "Is that caused by rabbits or is someone trying to get out?" 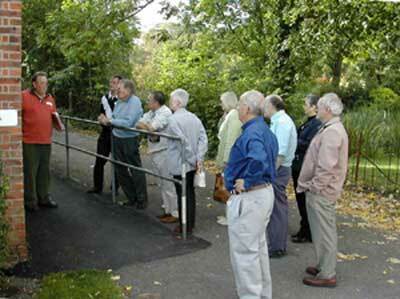 Margaret Baker, who is married to a descendant of Henry South, paid a visit on 6 October 2002. Henry was a younger brother of Joseph South and emigrated to Australia in 1853. Margaret was taken on a tour of the Hertfordshire villages connected with the Souths. The Archive has been invited to contribute towards a book about the Lea Valley Industry to be published by Harris Digital Productions in association with Lowewood Museum, Hoddesdon. 1. Many members of the South family are buried in Barley churchyard. To which Saint is the church dedicated? 2. Alfred South (who, as usual, sometimes called himself Bysouth) was a very smartly dressed man. He married Naomi Dockerill in 1868 at Barkway. He was neither a potter nor a brickmaker! What was his trade? 3. When Ann Bysouth died in 1844 at Royston Workhouse, she left a box, cloaked in mystery, that the Board returned to her daughter in law, Ann Bysouth. What was in the box? 4. In August 1869, Arthur South died in an accident with a relatively new fangled device at Barnet while not on his guard. His epitaph in Royston Cemetery might have mentioned that he 'laid his life on the line.' How did he die and what was his occupation? 5. Henry & Elizabeth South/Bysouth had a child baptised at Reed in 1744. The Register reads, 'which was the desire of the mother of the child that it should be so called.' What name was given to the child? 6. When John South was buried at Reed in 1690, the parish clerk added at note in the register that reads, 'in woollen.' Why did he consider that this was important? 7. Sarah Unwin married John South in 1849. Later members of the family owned the Unwin chain of wine merchants. a) Her family was not always called Unwin. What other eye-watering name did they have? b) The Unwins were not the only South connection with the drinks trade. What distillers of gin were related to the Souths? 8. In 1853 John and Sarah South from Barley emigrated to Victoria, Australia. They travelled on a ship named after a tyrant whose father had built 'a stately pleasure dome' at Xanadu. What was the ship called? 9. Another emigrant family were Joseph South/Bysouth, potter, and his wife, Mary Ann, from Barley and Edmonton. They left England on 7th March 1874 and reached their totally dark destination in May. To what country did they emigrate? 10. Mary Ann was Joseph's second wife. In total, how many children is it recorded that Joseph fathered? Answers: 1) St Margaret of Antioch; 2) Tailor; 3) Clothes; 4) Railway guard - run down by train; 5) Darenter; 6) Woollen Act 1666 imposed fine for other material used; 7a) Onion; 7b) Gilbey; 8) Ghengis Khan; 9) New Zealand; 10) 18. On 21 September members of the South family assembled at the Vintage Court Hotel, Puckeridge, for a weekend of family research. They were all directly descended from Edward South who was born in the village of Reed in 1570. One of the party, Michael Short, had travelled from his home in New Zealand to be present at the gathering. 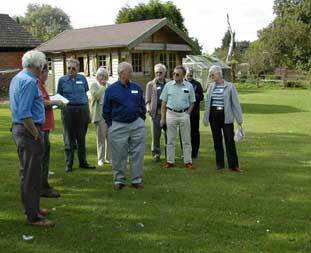 After an introductory talk, Tom Doig, the local historian, accompanied the party on a conducted coach tour visiting the places in the neighbouring villages of Reed, Barkway and Barley having South family connections. Amongst the locations visited were the parish churches, Barkway School and the site of the former brickfield at Morrice Green. "Tom Doig (left), local historian, tells members of the South family about the history of Barkway School"
"Tom Doig (second left), talking about the history of the Morrice Green brickfield near Barley"
Joseph South (1822-1906) learnt the skills of the clayworker at Morrice Green before leaving Barley and settling in Edmonton, North London, where, in 1868, he founded a pottery supplying flower pots to the Lea Valley Nursery Industry. Later, the business moved to White Hart Lane in Tottenham where it traded successfully until 1960. Joseph married twice and fathered 18 children. In the evening, Christopher South, journalist and BBC Radio Cambridgeshire broadcaster, hosted a party at his home in Little Chesterford. Before returning to her home in the Scottish Highlands, Brenda Oddy summed up the success of the weekend; "It has certainly made the family history come alive".